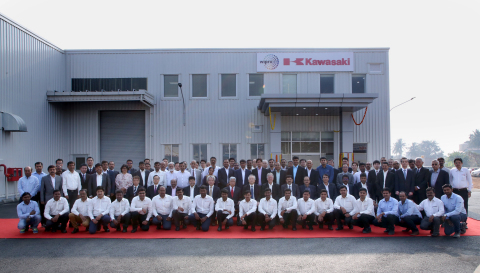 TOKYO--(BUSINESS WIRE)--Kawasaki Heavy Industries, Ltd. announced today that a new plant had been completed at Wipro Kawasaki Precision Machinery Private Limited, which manufactures, sells, and provides after-sales services for hydraulic equipment for the construction industry in India, and that its opening ceremony had been held on February 16. Focused on the growing demand for hydraulic excavators in India, Kawasaki decided to build this plant in Bengaluru, in addition to an existing plant in the same city. The move reflects Kawasaki’s commitment to meet the demand for hydraulic equipment used by local construction machinery manufacturers, and to generate new demand. With the additional floor space provided by the new plant, the total of two has doubled to 6,000 m2, and production capacity has also doubled from the 2018 level to 40,000 units per year. The increased production capability will enable Kawasaki to respond more flexibly to its customers’ varying production volumes. Although short-term variability is still to be found, overall demand for construction machinery in India has been on the rise due to an expected growth in investment in local infrastructure, such as expressways, railway networks, and ports. With respect to the hydraulic excavator market, medium- to long-term growth is forecast, as annual demand is expected to reach 40,000 to 50,000 units in fiscal 2025. Following in the footsteps of China, India is also expected to achieve rapid growth in infrastructure investment. Kawasaki has been strengthening its six-region operational structure, encompassing Japan, the UK, the US, Korea, China, and India – the focus of the current bolstering of production capabilities. In order to comprehensively enhance customer satisfaction, Kawasaki will further its efforts worldwide in developing and delivering high-quality, high-performance products and providing full after-sales services for this rapidly-growing hydraulic equipment sector. * To view a press release regarding the establishment of Wipro Kawasaki Precision Machinery Private Limited, access https://global.kawasaki.com/en/corp/newsroom/news/detail/20111207_1.html. Headquartered in Bengaluru, Karnataka, India, Wipro Enterprises is a leading member of the Wipro Group and one of the world’s largest independent hydraulic cylinder manufacturers. Wipro Limited, the third largest information technology firm in India, is also part of the Wipro Group. Kawasaki Heavy Industries, Ltd. has completed a new plant at Wipro Kawasaki Precision Machinery Private Limited.